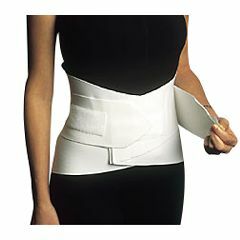 This Lumbosacral Belt will provide lower back and abdominal support and will help relieve back pain due to injury or muscle weakness. Larger and custom sizes available - Call our Customer Service Dept. This is a very comfortable back support. It has sufficient support but still allows some movement. I particularly like the shaping, which supports the coccyx but still allows for sitting. It is easy to wrap and secure. I've used other kinds of supports but this is my favorite. My only reservation is with the sizing. I fell on the high end of the Smaller size so I purchased the Large and it's slightly too large, all the hook and loop closures overshoot and just barely meet. When this one needs to be replaced I will take a chance and get the smaller size. Don't waste your money on this product!! Not Effective. cheapmaterial-poorly made. not good value. stitching came out. The fit was good. After wearing 2 times, the stitching attaching the Velcro to the fabric started coming out; unable to use after that. I don't feel that I should have to repair a product I've only worn a couple times!! Very poor quality of material and construction of this product. After talking with AllegoMedical's customer service, they were very helpful in resolving the issue of this product that I could no longer use. It provides additional support to my back when I am carrying and lifting around my little grandbaby and transferring my mother from wheelchair to bed. It helps my back but sometimes bothers my stomach if I wear it too many hours. Comfortable. Easy Storage. Sturdy. Safe. Comfortable. Lightweight. Sturdy. Good Fit. Easy to put on and wider then most which makes this item more comfortable to wear.